I like to forage while I walk from home to get the kids from nursery school. I push them back up the hill in our double stroller and it takes 80-90 minutes. On the way, we eat herbs and fruit that grow every where. Plums, Meyer lemons, figs, blackberries, rosemary, and lemon verbena to name a few. Yesterday I passed by a beautiful bush with clear purple berries. See photo above. Do you know what it is? I also think about whether or not there is a connection to rises or declines in urban foraging to gentrification happening in the SF Bay area. Anyone have a take on that? I have always wanted to forage but was afraid to. Could you consider doing a longer blog piece of urban foraging? I also think urban foraging is unknown. Where I am from it would be looked upon as a weird. Or someone would say, there are food pantry’s for things like that LOL. I don’t forage. If it’s on someone’s property I would not take it, even if it just goes on the ground and rot. I personally would feel “funny” doing something like that. At the very least, I feel it’s inappropriate, but that’s just me. Maybe others feel it’s fine. If I really wanted the food, I’d politely ask the owner of it first. Lorrie, thanks. I wanted to clarify that I don’t go on property. The edible plants are usually accessible while walking on the sidewalks. And there are tons of fallen fruit on the ground. We are indeed fortunate to live in an area of abundance. And I too feel nervous about foraging. I volunteer at a free farm stand in San Francisco, where we encourage neighbors to bring in extra produce from their gardens, which we give away for free to people in need, every Sunday in the Mission district. That’s one way we can help get people healthy vegan food regardless of race, gender, or income level. I love to forage. i have good news about foraging in many places because, like you, that food is there for us to eat and i can’t imagine it going to waste like that! my partner and i were traveling in portland, a biiig foraging community and there was a tree dripping sweet figs all over the ground. we grabbed some and the man who owned the property came out. we asked, can we have some? and he said, sure, that’s what it’s there for! i already took my harvest, the rest is for the foragers – the gleaners. i have also felt like it would be trespassing at other times in my journey so i either do it quickly and keep an eye out (hehe my sly side) or i ask the person, hey , are you going to use that fruit in your yard? it helps build structures of community, too; person by person. and diminishes the stigma around foraging. one time i was in a rich suburb and there were these unharvest apple trees RIGHT BY THE ROAD. my mom, partner and i all drove the car over with bags and bags and started picking the apples, off the ground, climbing the tree… people were staring, but i feel it’s part of my mission to remind people that THIS IS FOOD, TOO! no shame, no shame.. only yummy harvest 🙂 we got at least a bushel that day. in bloomington, indiana, where i lived for a bit, too, people had collected a lot of foraging destinations and put a google map together. the agreement was that if it was on private land you had to ask. also in Pasadena, CA, just outside of LA, i did some foraging alone and with a community group. i found that when i asked, people were usually MORE than happy to let me take it off their hands. a few times people realized the value of what they had after i requested it and then didn’t let me have it, haha, so that’s a funny outcome too. also, the plant you posted in a young poke weed. soon all of those berries will get dark dark and look soooo juicy and yummy, but they’re poisonous at that stage, so don’t forage then! young shoots can be eaten when they’re coming up in spring, but the plant still takes a lot of effort to eat (you have to rinse it multiple times to get rid of the strong chemicals/ alkaloids? i forget what’s in it) .. also the root is great in herbal medicine. I remember foraging sour cherries with a friend who was visiting from Iran in a public park in Leeds many years ago – I had never seen anyone taking this fruit, and certainly we felt no guilt about it – but on reflection it was perhaps depriving the birds of food and the soil of nitrogen since I don’t think human waste is recycled back into the environment appropriately (am I wrong?) My mum taught me to notice this… she always picks berries to eat in the Autumn, but she feeds the birds in her garden all year round, especially in Winter, to ‘pay them back’. I forage in Prospect Park and in low-traffic areas in New York City (and state). I regularly pick mulberries and linden flowers off street trees in NYC, but mostly for the stares. I’m always amused by the disconnect that people have with where their food comes from (the supermarket, silly! ), so I will pick fruit and flowers off street trees and wait for people to say something to me. I’ve only foraged in known public or “wild” spaces. That plant reminds me of pokeweed. 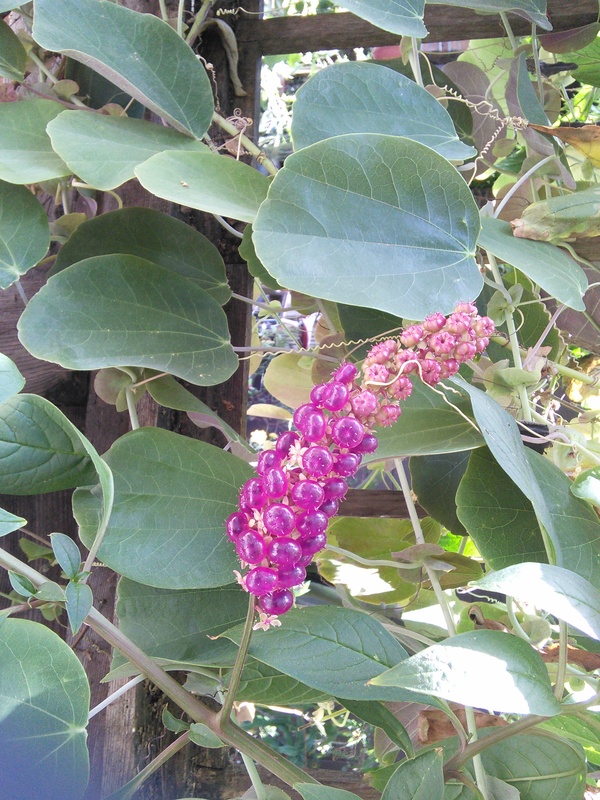 If it’s in the pokeweed family, it’s not safe to eat. I bet if you posted that photo on Twitter you’d be able to get an identification. The rule I was taught about which berries are safe to eat is to only eat the ones that have a five-star leaf crown. I forage only in a public garden space maintained by Urban Tilth in Richmond, so there is no problem with the owners objecting. (Can you believe the spell check does not have ’tilth”?) And I am white and old and present female and we can get away with anything. I am trying to get myself to do it more and I want to plant veggies in my yard but I do not want to do it alone. I am open to suggestions. I wish we had the organization Food is Free here in Richmond.